We talked for a while about what I want out of life, and the person I am striving to become. When the monk felt he had enough information, he started digging in boxes filled with old scrolls and papers. He finally emerged with an ancient tattoo design. My Sak Yant was a rare form of a paed tidt. It a circle with arrows pointing in different directions. What makes my rare is that most paed tidt only have eight arrows, but mine has 16. He explained the meaning of this tattoo and the magic Thai script inside. 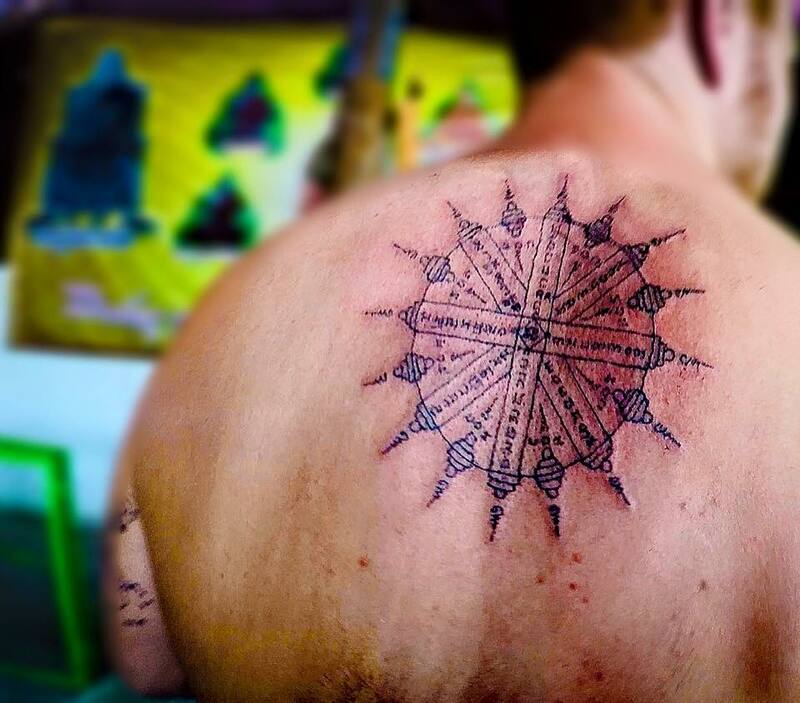 It was the tattoo of an adventurer and explorer. A symbol that would keep me safe while traveling but also make me strong enough to become the person I aspire to be. I person I am always one step behind as I chase him around the world. The needle hit a nerve, and my back went numb. I felt my skin start to turn red, and heat up, first to a simmer which quickly turned into a boil. As I sat their time seemed to slow, my focused narrowed to a world where only the monk, myself, and the bamboo needle existed. It was as if the magic in the tattoo had cast a spell over the shrine where we sat. The scorching heat and humidity of a Thailand summer day vanished. The conversation my interpreter was having with my mother, who was traveling wit me for a few weeks, faded from earshot. Even the golden buddhas, and statues that surrounded us disappeared. As I focused on the magic soaking into my back with every needle poke, I started to contemplate a few things. First, the burning sensation in my back had me debating if my skin had spontaneously burst into flame. Was everyone to here to polite to tap me on the shoulder and say ” Sir, are you aware that there are massive flames protruding from your back”? Secondly, I focused on the pain, and reflected on the conversation the monk, and I have just had. Lastly, I tried to commit everything to memory. Getting a Sak Yant from Ajran Rung is a great honor, and I wanted to remember the moment. A Sak Yant has become one of my favorite travel memories. 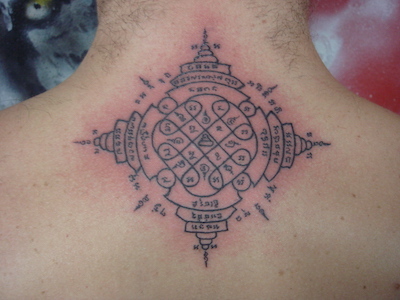 Since getting my tattoo, I have had people ask why I would get a Buddhist tattoo. I am not a Buddhist, though I do find value with a lot of the teachings. For me, a Sak Yant means a couple of different things which are why I got it. Frist, put aside the magic of a Sak Yant. The tattoo is also a symbol and a reminder. Ever time I see it I am reminded to stay strong through my struggles, and remember the person I want to become! For me, this tattoo is a declaration of self-improvement and a commit to the road. Another reason I got a Sak Yant was to express my love for Thailand, and it’s culture. It is a country that is dear to me. Whenever I feel travel burnout coming or need a break from moving, I head to Thailand. In many aspects, Thailand is a my second home. 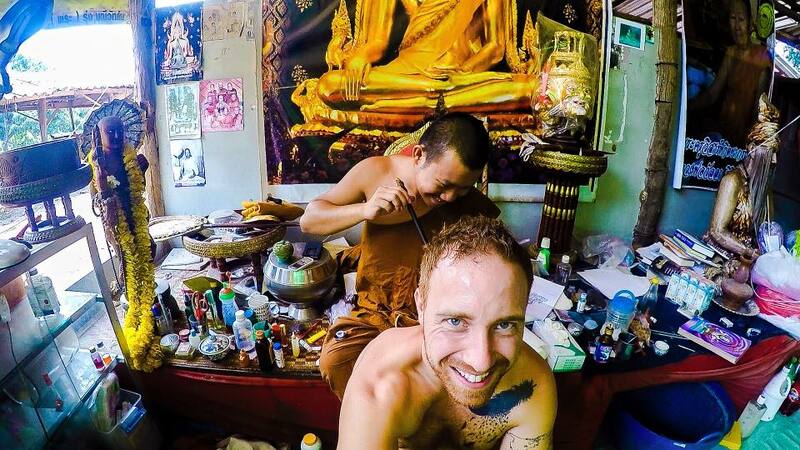 Getting a Sak Yant was an amazing moment in my life and it has become one of my favorite travel memories. not an experience I will forget soon. Stephen Schreck is a long-term traveler and explorer. He is currently traveling New Zealand where he is putting together his first reader tour.